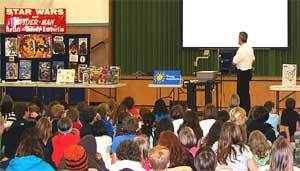 Why not kick off your Read-a-thon with an assembly presentation by Randy Emberlin on Comic Books and Storytelling? Randy Emberlin, well known Spider-man comic book artist and cartoon animator, is making himself available for assembly presentations to elementary and middle schools on the art of storytelling in both comic books and animation in the greater Portland Metro area. 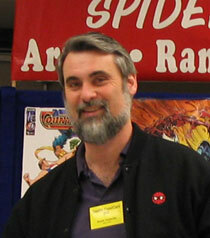 Randy has worked in the comic book industry for 20 years on titles such as Spider-man, Batman, G.I. Joe, and Star Wars. 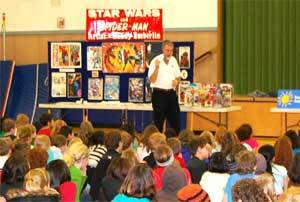 He engages students in a presentation that provides a fascinating look at the extensive process of, plotting, scripting, drawing, inking, lettering and coloring comic books. This one hour program takes children through the process of early thumbnail sketches into layout drawings and finally to finished pencils and inks. He discusses gesture drawing, perspective, dynamics and cinematic storytelling techniques. Randy also covers how an artist works from the writer’s script and gets along with his editor. Randy displays sketches, paintings, original comic book page art in pencil, as well as finished inks. He also displays a variety of comic books, Graphic Novels, trade paperbacks and other printed forms of the comic media that he has collected for students to examine. Randy follows each presentation with a challenge for children to work in teams of 3 or 4 and make their own comic book. 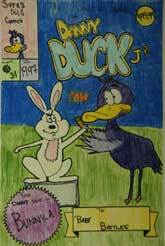 A layout master will be provided for duplication and autographed bookmarks will be available for all children. A second presentation Randy offers is the Art of Storytelling in Animation and how it relates to the comic book medium. During this one hour presentation, Randy takes children on a journey of how animation is conceived through early inspirational and character sketches, then is storyboarded much like a comic book following the strict cinematic rules. Finally, it is broken down into scenes and timed out for each animator based on the pre-recorded sound track so that they may begin their interpretation and execution. The concept of key drawings and in-betweens, spacing and timing charts with be discussed along with where the computer is taking animation today. Along with a slide show and over-head transparencies, a display of cel artwork, animation tools of the trade and other items of interest will accompany the presentation. During Randy’s one hour presentation he offers a comparison of the ‘comic book process’, (including script, pencils, letters and finished inks) to the basics of ‘animation production’ focusing on how planning and storyboarding techniques in animation relate to storytelling in the comic book artform. 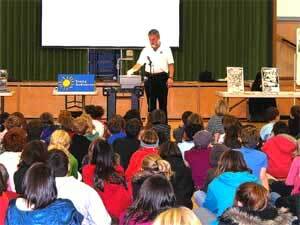 Children are encouraged to handle and scrutinize many original pieces of art. Drawing and inking tools of the trade are talked about and displayed along with a variety of comic publications in different formats Also, the use of ‘extreme’ and ‘inbetween’ drawings in the animation process will be demonstrated. The presentation ends with a short animated film showing different styles and techniques, followed by a question and answer session with students and teachers. The workshop consists of 4 one-hour sessions. Students work to design and create a comic book cover with all its elements. The cover, featuring at least 2 characters in action, should have a theme such as pioneers, space explorers, pirates, super heroes or monsters. The workshop emphasizes layout, design and lettering. Each student will design their two characters on “3-view model sheets.” The 11″x17″ cover will be penciled first, then inked or outlined with a heavy marker and fine point pen, then colored and finally mounted. The workshop consists of 5 one-hour sessions, usually over a five-week period. Students learn about plot, script and character design, followed by layout, finished pencils, lettering, inking and coloring. Comic books are a collaborative medium by nature, so the cooperative aspect of the comic book process is stressed with an emphasis on teamwork and communication to achieve results. During Randy Emberlin’s ninety minute appearance, he displays sketches, paintings, original comic book art in pencil and inks as well as a variety of comic books and Graphic Novels. 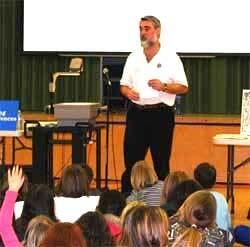 Randy answers questions about the comic book industry and offers an interactive workshop to both parents and children called “How to Create a Comic Book Cover“. 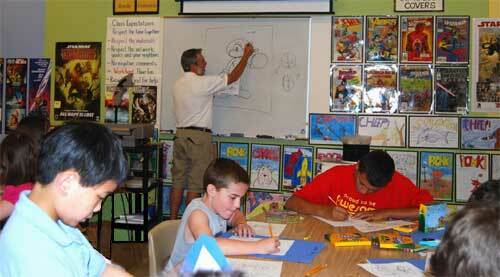 Parents and children work together to design two characters and create a comic book cover with all its elements.